Disclosure: I did not receive compensation to help promote this post. Mail4Rosey is not responsible for prize delivery. Hauck Toys manufactures fun, innovative products for boys and girls of all ages. Megan from Housewife on a Mission was sent a Superman Go Kart to review from Grand Touring Baby. Grand Touring Baby, if you don't know, is the official domestic distributor for Hauck, i'coo and Hauck Toy products in Canada and the USA! To read Megan's full review the Superman Go Kart, GO HERE. Innovative, durable and sport inspired design puts the driver of the new Hurricane pedal kart in complete control of any situation. The custom, ergonomic seat is adjustable and equipped with a high backrest – for a comfortable and safe sitting position. Speed can be kept in-check, even through curves, with the easy-to-use handbrake. 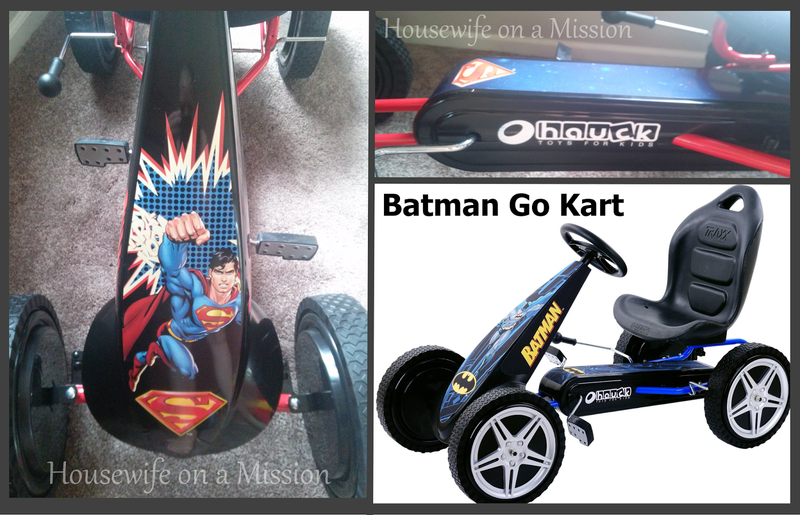 Kids love the Batman/Superman go kart due to its fantastic handling characteristics, child-oriented ergonomics and safety. In addition, it encourages physical activity, builds strength, endurance and co-ordination. These Go Karts, in a nutshell, are AWESOME!! I cannot image bringing this home to anything but a jumping up and down, excited child. 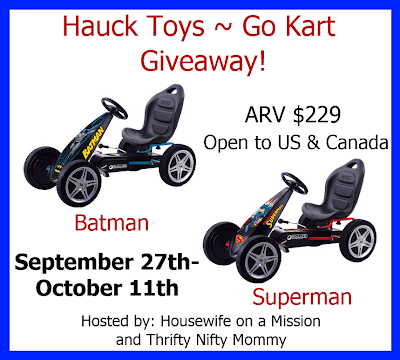 or Batman Go Kart (winner's choice) valued at $229! I don't know anyone that could use these, but they sure are cute. Pretty sure my little guy would do backflips over either one of those. ;) Thanks for visiting. How cool are those!? I have a few nephews who would go crazy for one! Thanks for the opportunity! My little 18 month old grandson could grow into one, right? Thanks for the fun chance to get it. My kids would go CRAZY over this. I've never seen an entry form like this, it's pretty cool! I rarely get super excited over giveaways but I would LOVE this one! You'd definitely have happy kiddos I think, if you came home with this win! Nice giveaway! I know a boy that would love this but he probably is a little big for it. Have a lovely weekend Rosey! Now this woulod be a great one to win. I know a boy or two that would take it off my hands. Great giveaway Rosey! Any child who gets one of these is going to be thrilled! I was all excited to get one of these, for myself, until I saw the age limit (never mind the weight limit). Awesome giveaway! Would love for my son to get one of these for Christmas! I like the i’coo doll accessories ‘Grow With Me’ set for my daughter. She'd love something like that. I also like the Super Man Balance Bike too. The balance bikes look cool too. I love the i'coo 1-2-3 Grow With Me! I also like the Batman Balance Bike. Hauck FreeRider !!! Thats awesome! I visited the website and looked at the The Heart 2 Heart doll accessories product line. Really sweet, bet my grandchild would love these. I also loved the FreeRider. I would love their Heart 2 Heart toys. 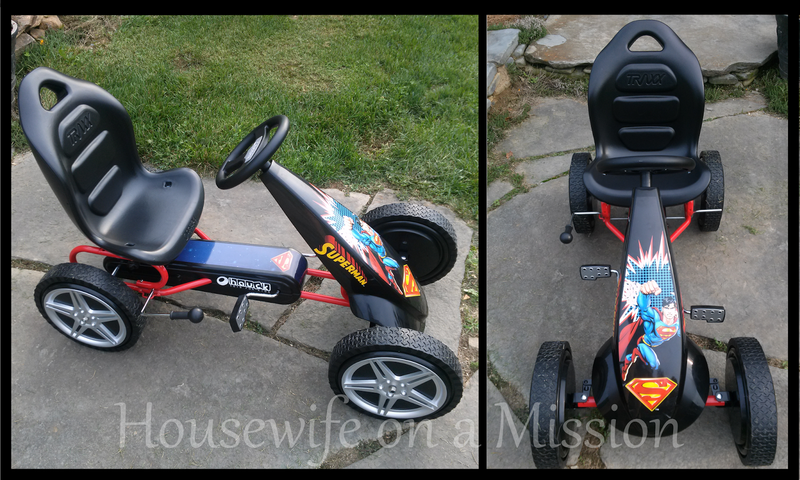 The superman balance bike looks great as well, but my kids would love the go kart the most!